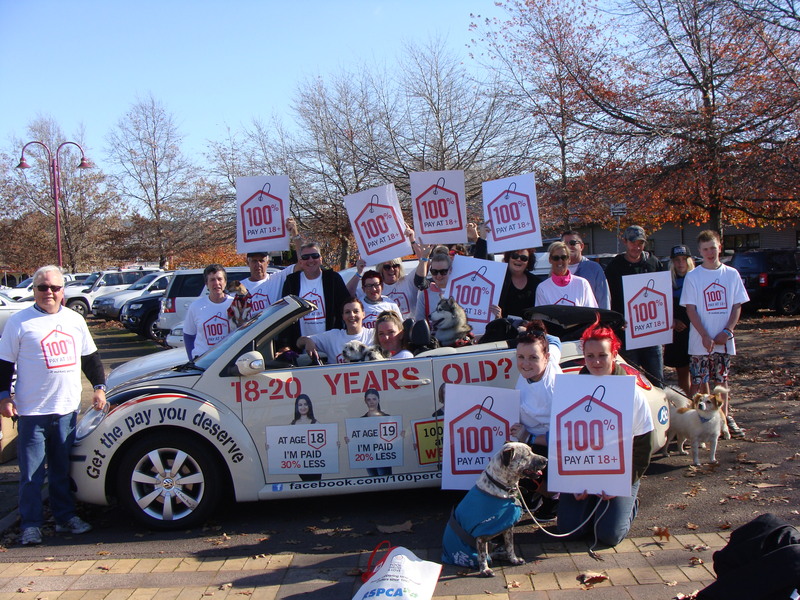 The SDA launched the 100% Pay at 18+ campaign April 9th 2013. It has been a great success nationally and for the Tasmanian branch with over 50,000 campaign supporters from all over the country joining together to show their support for fair pay. There are in excess of 3,100 supporters based in Tasmania whose support has been accumulated at a variety of local campaign events, through media and campaign awareness generated across the state. The SDA won the case for 20 year olds in 2014 with Fair Work Australia ruling 20 year olds retail workers would soon commence receiving the full adult rate of pay. The National Retail Association were quick to appeal our case but to no avail. The fight continues for the adult rate of pay at 18 and 19. Visit the 100% Pay at 18+ campaign website www.100percentpay.com.au for further information or click the button below to register for your support. Please feel free to contact us to find out how you can get involved with our next event and show your support for fair pay.